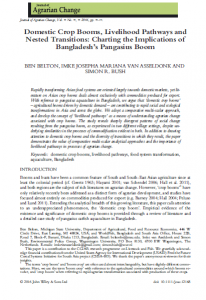 Authors: Ben Belton, Imke Josepha Mariana Van Asseldonk, and Simon R. Bush. Asian food systems are oriented largely towards domestic markets, yet literature on Asian crop booms mainly deals with commodities produced for export. The authors argue that 'domestic crop booms' are contributing to rapid social and ecological transformations in Asia and across the globe. They use a comparative multi-scalar approach, and develop the concept of 'livelihood pathways' to better understand agrarian change associated with crop booms.